We’re not making this up. It’s a real product from the great folks over at Belkin. It’s a Lightning dongle that features a Lightning port for charging plus an Ethernet port. Straight from the world of weird and wonderful dongles comes a new product from Belkin which is tailor-made for the iPhone and iPad. It features a Lightning passthrough port for charging up your iPad or iPhone but the party trick is that Ethernet port, allowing you to hardwire your mobile device to the internet using the convenience that is an Ethernet cable. But here comes the the best part about this dongle: even without connecting the Lightning cable to the cable, you can still charge your iPhone or iPad over Ethernet since this dongle supports PoE (Power over Ethernet) feature. 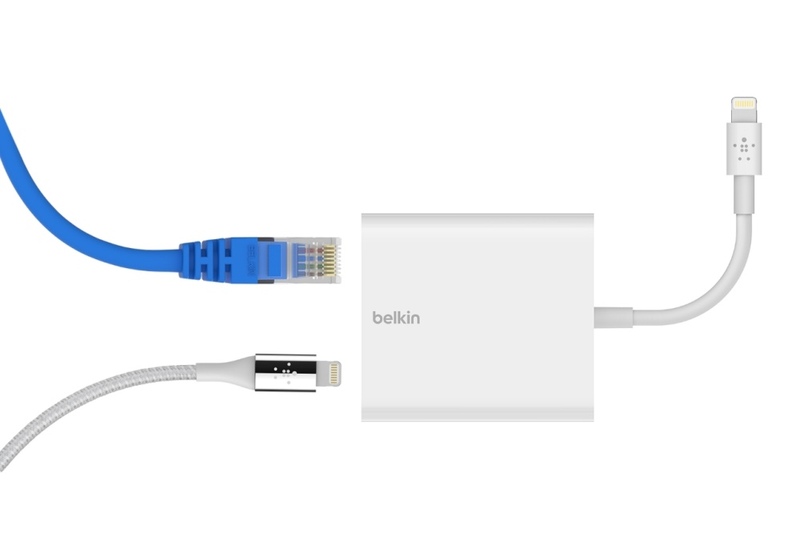 Belkin’s Ethernet + Power Adapter with Lightning Connector is the perfect solution if you or your business need a fast, secure, and reliable wired Internet connection for your iPhone or iPad. It offers both Power over Ethernet and Lightning ports, so you can connect to a secure network while continuing to charge your iOS device. Power over Ethernet compatibility also provides another convenient way to connect and charge simultaneously with a single cable. This adapter works with Power over Ethernet-enabled connections, so when PoE is available there’s no need to plug in a Lightning cable—simply charge through your existing PoE-enabled cable. There’s a dedicated app for this dongle too in order to make sure that the firmware is up to date and everything performs as optimally possible. On the speed front, you can expect up to 480Mbps over Ethernet, which is not bad, really. But if you are interested in the full set of features of this dongle then head over to this link. This dongle is not cheap by any means and will set you back a cool $99.99, which is quite a lot for this sort of functionality. But if you really want Ethernet on your iPhone or iPad and is backed up by a name that resonates with many, then this is the accessory of your dreams.